Keep your pets looking fresh and clean and leave the mess with us! Your dog deserves nothing but the best with an Award winning Stylist. We offer a full range of services that will leave your furry friend looking and feeling fabulous. At Bonejour Pet Grooming Salon, we provide professional dog grooming services in a safe and clean environment. Your pup will be pampered by a team of trained and experienced groomers that will place your pet’s health and well-being above all else. We know that our clients and their dogs have individual needs, which is why we offer more services than other dog grooming salons in Barrington, IL and the surrounding areas. For busy clients with a lot on their hands, we can provide a pick-up and delivery service for your pooch. We also have a self-service dog wash for your convenience! If you want your dog to be a real head-turner, maybe it’s time to go beyond the conventional grooming styles. Your beloved pet can have a truly unique look with our Asian Fusion Grooming services. Tell us how you want your dog to be styled and we’ll do our best to make your vision a reality. Regardless if it’s rounding the muzzle, body Mohawk sculpting, or a dash of extra color, we’ll be happy to make your pup look like a star. 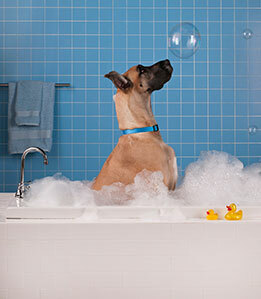 We understand that certain types of dogs require specialized grooming. Cristy of Bonejour Pet Grooming Salon specializes in Designer dog breeds such as Golden Doodles. Being a Certified Master Groomer and with over 30 years of experience, you can have peace of mind that your dog will get the superior grooming by an expert in the industry. Why don’t you treat your furry friend to a Peppermint Massage or a Plump Perfect Facial Scrub? Not only do we provide exceptional dog grooming services, but we also give our Barrington, IL clients services with great value. With a purchase of grooming, first-time clients can choose three options of up to a $40 value from our A La Carte Spa services. Ask us about our grooming specials today! To set an appointment for your stylish pet, call us at (847) 381-3330. You can send us a message at cristy@bonejourpetgrooming.com to learn more about our services. We serve Barrington (including North Barrington, South Barrington, Barrington Hills and Lake Barrington), Algonquin, Cary, Crystal Lake, Deer Park, Fox River Grove, Hawthorn Woods, Hoffman Estates, Inverness, Island Lake, Lake in the Hills, Lake Zurich, Long Grove, Palatine, and Wauconda, IL. To find out more, get in touch by visiting our contact page and filling out the form or call-us at 847-381-3330. Treat your pet to the pampering it deserves. Call us at (847) 381-3330 or send a message to cristy@bonejourpetgrooming.com to set an appointment.